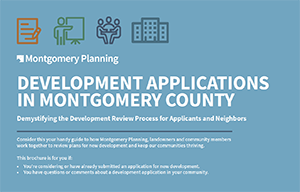 Select from the plan types below to read full plan type descriptions, download supplemental materials and start the application process. Subdivision plan used to create, consolidate, or adjust property lines through administrative approval. Optional, flexible plan type allowing applicant to get staff feedback at Development Review Committee. Application to allow certain uses in certain zones that are acted on by the Office of Zoning and Administrative Hearings. Plan that outlines specific strategies for retaining, protecting, and reforesting or afforesting areas on a site. Plans submitted by government agencies. Plan showing existing natural features. Subdivision plan that establishes types and intensity of uses as well as sets lot lines. Optional plan type submitted ahead of Preliminary Plan to receive Planning Staff and sometimes Planning Board feedback. Outdated plan type that may only be amended. Plan showing approved subdivision required before release of building permit. Detailed plan required in floating zones, most overlay zones, and for some optional method projects in Commercial Residential zones. Illustrative plan that shows maximum densities and sets public benefit categories required for optional method development. Includes Extension Requests, APF Reviews, Subdivision Regulation Waivers, Fence-in-Easement Applications and other forms and resources.